This set of Genetic Engineering Quiz focuses on “Bacteriophage Lambda-2”. 1. Which of the promoter requires low level of cI gene for its activation? Explanation: The promoter requiring low level of cI gene for its activation is PRM (Promoter for repressor maintenance). It is inactivated by high levels of cI gene. 2. Choose the correct statement with respect to lysogen and prophage. Explanation: The integrated phage is called as prophage and the infected bacterial cell is known as lysogen. Lysogens are immune to further infection by the same phage. If only growth of few lysogens would take place, the lawn would be turbid. In the acse if lysogens aren’t formed, the plaques would be clear. 3. Choose the incorrect statement for cro and Q proteins. Explanation: The cro and Q proteins are required for the lytic life cycle to continue and cII protein is not required for it. Cro protein inactivates the PRM promoter and the Q protein is responsible for expression of late genes. These late genes are responsible for producing coat proteins, allowing assembly of functional phage and cell lysis. Explanation: Induction of lysogen takes place because of low levels of cI gene. It is caused by specific proteolysis under the action of host recA protein. 5. Which of the phage genes are responsible for phage excision? Explanation: As the level of cI genes fall, the repression of PR and PL genes is lifted up. Now phage genes are expressed and xis and int genes are expressed. These genes are responsible for causing phage excision. 6. How many phases are there for replication of lambda DNA to take place? Explanation: There are two phases for the lambda DNA replication to take place. They include the theta mode and rolling circle mode. Explanation: The first phase includes circularization of the molecule by annealing of the cos sites and they replicate in a bidirectional theta mode. This leads to generation of an additional circular DNA molecule. 8. Choose the incorrect statement with respect to rolling circle replication. Explanation: The second phase constitutes of rolling circle mode. It is done with a single replication fork and yields concatemeric molecules. They are required for assembly into mature phage particles. The packaging region should be flanked by the cos sites. Phage DNA is inserted onto the phage head and the cos sites are brought adjacent to each other. It is followed by cleavage at cos sites and it leaves 12 nucleotide long staggered ends. The cos sites are required for packaging to take place. 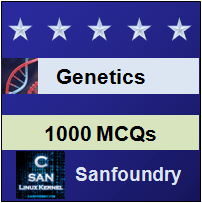 To practice all areas of Genetic Engineering for Quizzes, here is complete set of 1000+ Multiple Choice Questions and Answers.